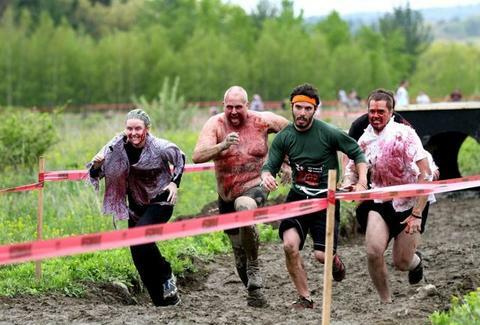 Should either Stumblers or Chasers snag all three of your flags you'll be marked as "Dead" on arrival at the Safety Zone, but if you're the quick and the dead you'll be enrolled in Chasing 101 and sent back to hunt down the remaining runners. Survivors and walking dead alike will receive moisture wicking tees from Warwear, as well as medals of honor/dishonor. Afterwards you'll rage at an Apocalypse Party featuring bands, copious drinks, and celebrities (? ), and there's also an overnight camping option where you can... not shower, and abandon all hope of getting brain.